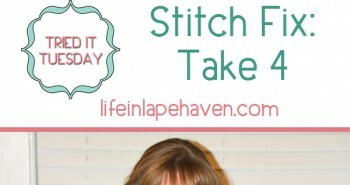 Last year on my birthday, my hubby signed me up for a Stitch Fix account. In case you haven’t heard of them, Stitch Fix is an online clothing subscription where you fill out information on your style and sizing, and their stylists send you 5 pieces of clothing to try on based on your information and requests. Each time you receive a box, you are charged a $20 styling fee, but if you keep an item or two or all of them, the $20 goes toward the purchase. You have 3 days to try on the pieces and decide which you want to keep and which you want to return. When you decide, you go to your profile and check-out. Then you drop the stuff you want to return into the provided envelope and mail it back for free (free-ish if you didn’t keep anything). They ask you at check-out what you like or don’t like about each item, so the next box is even more tailored to you. 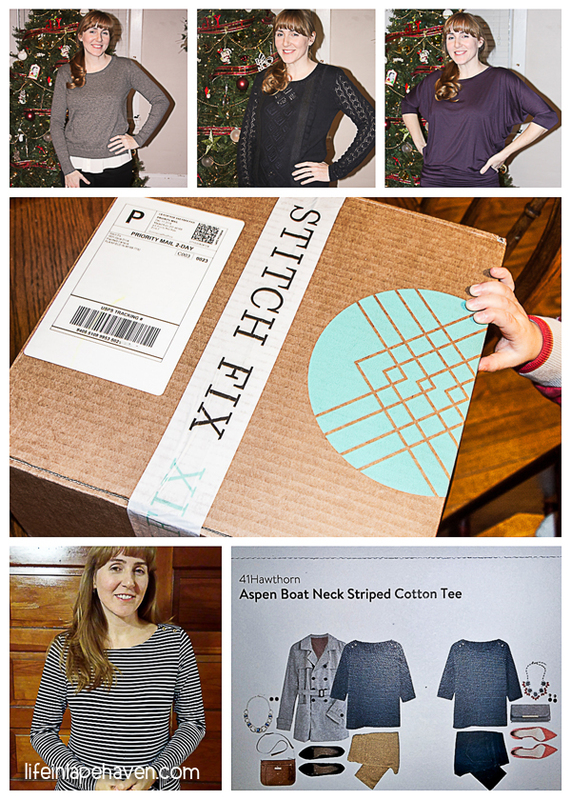 I had heard about Stitch Fix off and on and was anxious to see what it was all about. Filling out my styling information was fun and easy and setting up a delivery for my first box was pretty exciting. I decided to set mine up to come every other month initially. When my first “Fix” came, it was like Christmas. My boys were nearly as eager as I was to see what was in the box. I was pleased with what I received, even though there were a few sizing and style issues. However, given that it was my very first box, I was satisfied that I liked two of the pieces enough to consider keeping them. Then I had to decide if I liked them enough to pay for them (most pieces I’ve received are around $40-$60 each) or not enough and lose $20. 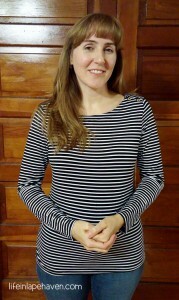 I ended up keeping a navy striped long-sleeved shirt, and I’ve worn it often since. (Don’t pay attention to me in the pics – late evening photo session after a long day). My second “Fix” came close to the actual Christmas, and I was really happy with how well the stylist did in picking things to send me with just the little feedback from my previous box. 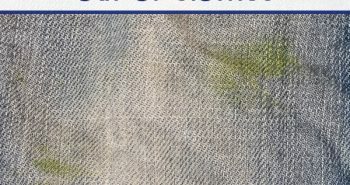 The fit on all the items was great (4 tops, 1 pair of paints), but some I liked better than others for various reasons – comfort, personal taste, and so on. Being so close to Christmas, I wasn’t willing to pay to keep every piece (which is usually at least $200 even with the “buy all 5 pieces” discount of 25%). 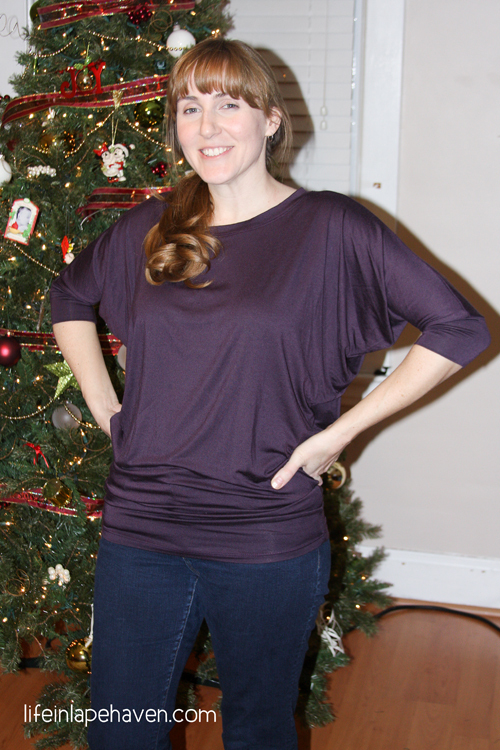 I ended up keeping a purple shirt with Dolman sleeves, which again has seen a lot of wear. My third box was, again, a good mix of the right fit and style. I kept a cute sweater from that Fix. However, with the change of seasons, I found that I had a sufficient wardrobe to see me through spring and summer, so I put my deliveries on hold for a while. 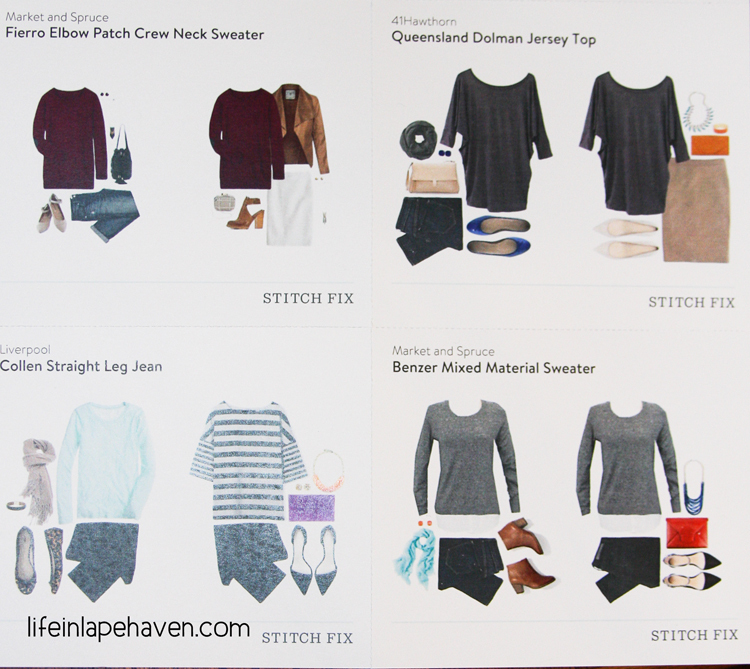 Overall I’ve had a pleasant experience with Stitch Fix. For me, it’s fun trying things this way and easier than having to drag two little boys and a big boy through a department store or two and several trips to the dressing room. (Dressing rooms and 2-year-olds do not work well together!) Hubby says that he looks at the stylist fee as saving him from having to go shopping all day. I think the $20 just helps make it easier to justify keeping at least one thing from every Fix. I’ve also found that I’ve tried and liked different styles than what I would pick out for myself sometimes. And I always get compliments on the pieces I’ve purchased. (Glad to know that being home all day with two boys hasn’t completely eroded my slight sense of style! Haha) Stitch Fix also send little cards with how to style each piece they send, which helps give you the courage to try something new. Besides the fun, convenience, and style, I’ve found that having a nearly guaranteed good fit on each piece I’ve tried on is wonderful. The survey you fill out when you set up your account is so detailed that they know exactly what pieces to send you. I’d have to walk all over the mall and spend hours trying on clothes to get 5 pieces that fit me as well as my last box did. So far, the quality of the pieces has been good. All three of mine are hand-wash only, though, so that may help (It’s not my favorite way to have do laundry and definitely a slight negative when I think of what I’d like to keep from a Fix).Since the quality and fit have been better, the higher price has been worth it for me, even though I still can’t bring myself to spend a huge chunk of money to keep all 5 yet. I’d have to love each piece a lot for that to happen. 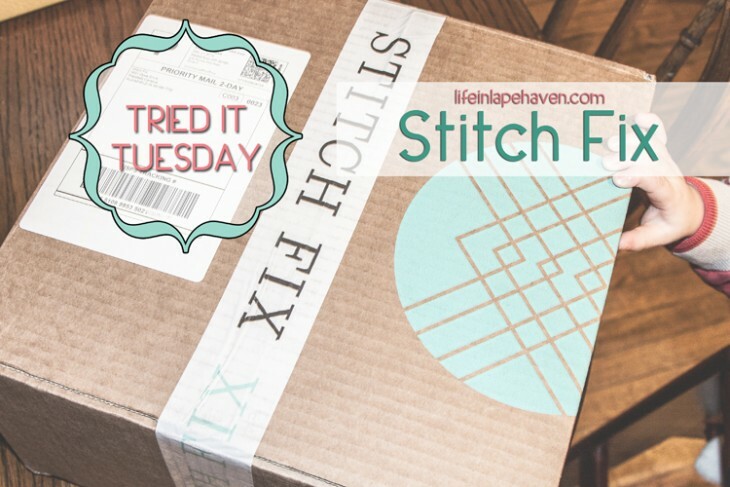 If you haven’t tried Stitch Fix, I think it’s definitely worth ordering a box or two, just for the fun of trying on stylish clothes in the comfort of your home. You can check them out here. 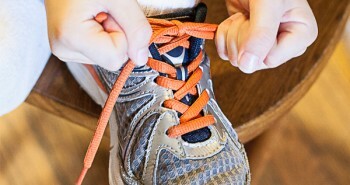 If you have received a Fix, let me know about your experience.